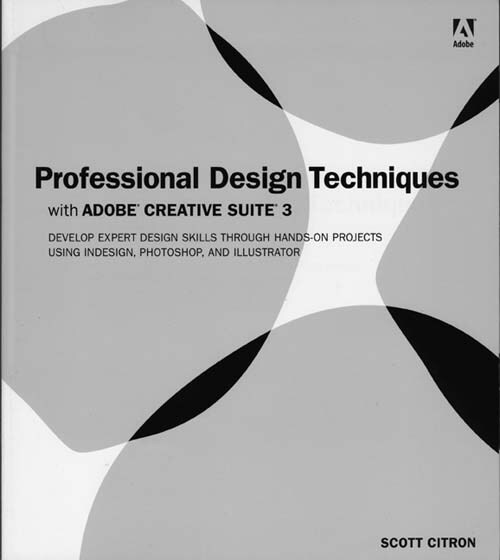 Professional Design Techniques with Adobe Creative Suite 3, by Scott Citron, is an ambitious reference book that delivers. The book provides a solid foundation of basic design principles, as well as software tips for beginners to intermediate designers. It provides direction on how to use the Creative Suite CS3 components together, with advice on which tool is best for which job, and tips on how to streamline the production process and how to use color effectively. The book is beautifully illustrated in full color, mostly with the author’s photographs and artwork. Full color screenshots taken on a Macintosh reinforce all the tutorials. The book has a companion website at www.peachpit.com/prodesignCS3 where you will find the project files and can follow the lessons. A useful list of resources in a PDF format is also provided. The final chapter is about workflow and covers monitor calibration, color settings and synchronization in Bridge and wraps up with a tutorial on the production of a CD package. All the projects in the book are relevant to the day-to-day work of a graphic designer. Chapter 1 should not be overlooked; it is mostly an introduction to the principles of good design and includes a comprehensive introduction to Bridge. It also covers the Preferences dialog boxes for Photoshop, Illustrator, InDesign, and Arobat 8 Professional. I found this section of the chapter very useful and important. The book is well written and very accessible, and it is a treat to observe the thought process of a talented graphic designer such as Scott Citron. I highly recommend this book to graphic design students, instructors as well as seasoned designers.